A surprising number of people seem to believe that you need to live in landed property in the countryside in order to live a more environmentally-responsible lifestyle. Members of the public often say to the Green Living volunteers that they will start 'living greener' when they retire and are able to move to the countryside where they can plant trees, install solar panels and grow their own vegetables and fruits. 1. Apartments take up much less physical space than a home. Hundreds of people can live in an apartment complex that takes up the same amount of space on the ground as a single family home. Apartments build up, while houses build out. Less land will be developed, and this has a better overall impact on the environment. 2. Apartments are typically smaller than landed properties, and thus require less energy to power, light, heat and cool. Apartment-dwellers do not have to worry about porch and back door lighting and electronic gates, or buying lawnmowers and leaf blowers. 3. Apartments in cities are generally closer to public transport hubs and stops. Transportation service providers generally cover areas with many residents, and this frequently includes apartment complexes. This reduces the need to drive and to own private vehicles, thus reducing energy use and carbon emissions. 4. Apartment dwellers generally buy less and own fewer pieces of furniture and electrical appliances compared to houseowners, due to space constraints. Apartment dwellers do not have the option of storing things in the driveway, attic, garden shed or covered backyard that houseowners do. As such, their consumption of goods and resources is generally lower than that of houseowners. 5. Resources and spaces are shared in apartment complexes. This means that there is only one swimming pool, playground, gym, garden, yard, multipurpose hall and one set of parameter lighting and recycling bins that need to be maintained, repaired and cleaned. The rubbish collection truck only needs to make one stop. Apartment dwellers will not have to worry about roof repairs, installing gutters, weeding and mowing the garden, or driveway and garden maintenance, and this reduces the economic and environmental cost of home ownership. - Give due consideration to the environment and your space constraints before you buy or acquire anything else for your apartment. Instead of having the mentality that you can donate or give an item away later if you no longer need it or if it is not a good fit for your apartment, consider not acquiring it in the first place, thus reducing waste. Refer to blogs such as Zero Waste Home (www.zerowastehome.com) and Becoming Minimalist (http://www.becomingminimalist.com/) to find inspiration on what you can live without and other ways to make do. - Consider joining or setting up a cause similar to Craigslist, Freecycle and TTDI Free Market (https://www.facebook.com/events/655261001183666) to swap, donate or acquire preloved items. If you are in the apartment joint management panel/committee, consider holding a Yard Sale or Free Market to enable residents to share and reuse resources. You could also set up a Borrowing Shop where residents can borrow or rent infrequently-used items such as hand tools, baking equipment and children's items. - If there are no recycling bins in your apartment complex, request the building management or joint management committee to write in to Alam Flora or other waste management companies or organisations to set up recycling bins in the lobby of the apartment complex. You can also contact organisations such as TEEAM (Email teeam@teeam.org.my / teeam52@gmail.com) to request the setting up of electronic waste collection bins and Persatuan Amal Sri Sinar / Buddhist Tzu Chi Merit Society / Rotary Club for the setting up of donation bins for used clothes, household items and recyclables. The bins should preferably be placed in a well-lit area with lots of foot traffic to prevent vandalism and the dumping of dirty and unsuitable materials in the bins. - Solar photovoltaic (PV) panels are only a good investment if your energy usage is high, or if your roof receives direct sunlight daily (i.e. not blocked by higher buildings or hills). A good alternative to installing solar PV panels would be to reduce energy usage as a whole, and to put up high-quality solar lights (e.g. Nokero solar light bulbs) in windows, balconies and areas that receive plenty of direct sunlight. This way, you save on lighting areas such as the balcony, bathrooms and rooms which are not used for reading, using the computer or doing work which requires bright lighting. - To save on energy bills, use curtains, blinds and window tints to cut down on solar heat entering the apartment in the daytime. This will reduce the need for air-conditioning in the apartment unit. If you need to use an air-conditioning unit, switch it on only long enough to cool down the room, and then switch it off, and switch on the fan to circulate the cool air instead. - Most of the energy used in residential homes is used for heating and cooling. The fewer heat-generating appliances you have in a home (e.g. dishwasher, dryer, oven, steam vacuum cleaner), the less need you have for air-conditioning, and the lower your energy bills. Wash dishes by hand and hang laundry out to dry. Stagger your laundry days to ensure that each load of laundry has a day or two to air-dry. Laundry racks and lines that can be put away when not in use can help you create more space to hang laundry out in, without creating unsightly clutter. - Many apartment dwellers complain that they are unable to collect rainwater for reuse. If you have a balcony or corridor that is exposed to the rain, you might want to consider putting up lightweight PVC or aluminium rain gutters to channel rainwater into a rain barrell. Create a water permeable cover for the rain barrell using mosquito screen or wire mesh to prevent mosquitoes and other insects from breeding in the rainwater. Use the water for cleaning, flushing the toilet and watering plants. - If you are unable to collect rainwater, you can still find ways to collect and reuse greywater. Designate a pail for greywater in your bathroom. Collect the water you used in rinsing and washing when you wipe down furniture, clean the windows and handwash clothes. 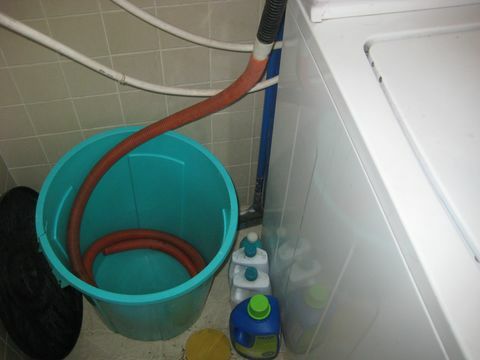 You can also redirect your washing machine outlet hose into a large bucket to collect soapy laundry water in, or collect the water from showering and washing your hair if you have a sturdy, shallow tub to stand in. Ensure that the water is not filled with dirt, hair and grease or it could clog up your plumbing and water pipes. The water should be only mildly dirty and soapy. You can use the water for flushing the toilet with, as flushing the toilet makes up about 31% of household water use. - Water that you use for washing rice, vegetables and fruits can be collected and used for watering the plants. - To reduce the amount of water used per flush, fill up a 0.5 litre plastic bottle with marbles or pebbles, top it up with water, seal the cap onto the bottle and put it in your toilet tank as a displacement device. - Apartment dwellers often complain that they are not able to practice composting or vegetable gardening, and as such feel disconnected to the earth. Find out if there are community gardens and edible gardens in your area that you can visit, volunteer at and contribute to if you miss gardening. Examples include the Free Tree Society of Kuala Lumpur, TTDI Edible Garden Project, and Eats Shoots and Roots. - If there is any unused land in your apartment complex, ask the apartment management or Joint Management Committee if it can be converted into an edible garden. Have the area fenced up. Keys can be given only to residents involved in the project, to prevent pilfering and vandalism. - Consider having a container garden, and customise it to fit your needs and your apartment's space constraints. Increase your space by growing vertically. You can grow pots of herbs, vegetables and spices on a vertical planter wall, in a pot stand, along the balcony grill, or in hanging pots suspended from a beam or hooks. - Spider plants (Chlorophytum comosum) are a good indoor plant to have, as they improve air quality. Money plants (Epipremnum aureum) and Arrowhead plants (Syngonium podophyllum) are hardy green plants that are able to survive without soil. Simply immerse their roots in jars of water and place the jars in each room to improve air quality. - You can try making compost in your balcony even without having to purchase a worm farm or bokashi bin. Cut your vegetable and fruit peels, bread crumbs and eggshells into pieces and let them dry out in an empty plant pot on the balcony. Do not compost cooked food, dairy or meat. Stir up the compost from time to time to prevent mould from forming. You can use the compost in your own potted plants once the plant matter has crumbled up and decomposed sufficiently, or you can give it to a community garden or a friend who has a garden. You can also toss into into the jungle, under the trees, during your next hike. - If you do not receive enough direct sunlight on your balcony to make compost, and mould and smell is an issue, simply store your fruit and vegetable peels in the freezer until it is time to take it to a jungle or garden. Label a lidded jar or container clearly with the words "Compost". Fruit and vegetable peels should not smell or contaminate your refrigerator (remember that you are not supposed to compost rotten plant matter or cooked food) and will last for months in a freezer.